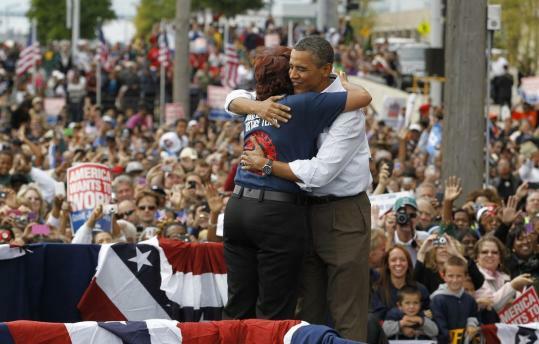 DETROIT - President Obama used a boisterous Labor Day rally to put congressional Republicans on the spot, challenging them to place the country’s interests above all else and vote to create jobs and put the economy back on a path toward growth. “Show us what you’ve got,’’ he said. In a partial preview of the jobs speech he will deliver to Congress Thursday night, Obama said roads and bridges nationwide need rebuilding and more than 1 million unemployed construction workers are itching to “get dirty’’ making the repairs. He portrayed Congress as an obstacle to getting that work done. “We’re going to see if we’ve got some straight shooters in Congress. We’re going to see if congressional Republicans will put country before party,’’ he said. Police said thousands of people attended the rally. The event had the feel of a campaign event, with the union audience breaking into chants of “Four more years’’ throughout the president’s 25-minute speech. Meanwhile, the US Chamber of Commerce unveiled its own jobs plan yesterday. The business lobby called for measures to boost employment immediately, including stepped-up road and bridge construction, more domestic oil drilling, and temporary tax breaks for corporations. If the measures are enacted, the chamber says, corporations would spend much of the nearly $2 trillion that has accumulated on their balance sheets and generate more than 6 million jobs by 2013, and more in ensuing years. The chamber’s jobs campaign will encourage business leaders to contact Congress and the White House to prod them into passing job-creation legislation. Congress returns from its summer recess this week. Besides spending on public works, Obama said he wants pending trade deals passed to open new markets for US goods. He also wants Republicans to prove they will fight as hard to cut taxes for the middle class as they do for profitable oil companies and the wealthiest Americans. The president is expected to call for continuing a payroll tax cut for workers and jobless benefits for the unemployed. Some Republicans oppose extending the payroll tax cut, calling it an unproven job creator that will add to the nation’s massive debt. The tax-cut extension is set to expire Jan. 1. Republicans also cite huge federal budget deficits in expressing opposition to new spending on jobs programs. But Obama said lawmakers need to act - and quickly. “The time for Washington games is over. The time for action is now,’’ he told the supportive union crowd. Republicans dubbed Obama “President Zero’’ after a dismal jobs report last Friday showed that employers added no jobs in August - which hasn’t happened since 1945. The unemployment rate remained unchanged at 9.1 percent. The report sparked new fears of a second recession and injected fresh urgency into Obama’s efforts to help get the unemployed back into the labor market - and improve his reelection chances. No incumbent in recent times has been reelected with a jobless rate that high, and polls show the public is losing confidence in Obama’s handling of the economy. His approval rating on that issue dropped to a new low of 26 percent in a recent Gallup survey. Romney will try to get ahead of Obama by outlining his job-creation plan in a speech today in Nevada, two days before the president addresses Congress. Obama plans to visit Richmond on Friday, the day after his speech, on the first of many trips he will make to rally the public behind his plan. House majority leader Eric Cantor, Republican of Virginia, one of Obama’s fiercest critics, represents part of Richmond. Aides say Obama will mount a fall campaign centered on the economy, unveiling different elements of his agenda heading into 2012. If Republicans reject his ideas, the White House wants to use the megaphone of his presidency to enlist the public as an ally, pressure Congress, and make the case for his reelection. “People will see a president who will be laying very significant proposals throughout the fall leading up this next State of the Union’’ address, Gene Sperling, director of Obama’s National Economic Council, said in an interview.